Ra Pharmaceuticals Announces Completion of Dosing in Phase 2 Program of RA101495 SC in Paroxysmal Nocturnal Hemoglobinuria - Ra Pharmaceuticals, Inc.
Ra Pharmaceuticals, Inc. (NASDAQ:RARX) announced today the completion of dosing and topline data for the Company's global Phase 2 clinical program evaluating RA101495 SC for the treatment of paroxysmal nocturnal hemoglobinuria (PNH). Ra Pharma is a clinical stage biopharmaceutical company focusing on the development of next-generation therapeutics for the treatment of complement-mediated diseases and is developing RA101495 as a novel, subcutaneously-administered (SC) inhibitor of complement component 5 (C5) for treatment of PNH, generalized myasthenia gravis (gMG) and severe, debilitating renal diseases, such as atypical hemolytic uremic syndrome (aHUS) and lupus nephritis (LN). The global, dose-finding Phase 2 clinical program enrolled a total of 29 patients in three cohorts, including patients naïve to eculizumab (n=10) and patients with prior eculizumab exposure, including eculizumab switch patients (n=16) and eculizumab inadequate responders (n=3). A total of 21 patients completed the initial 12-week dosing period and 16 of those patients (or 76%) are continuing treatment with RA101495 SC in the Company's long-term extension study (8 naïve patients and 8 switch patients, including all 3 inadequate responders). All 10 eculizumab naïve patients successfully completed 12 weeks of dosing. RA101495 SC met the primary endpoint, demonstrating a rapid, robust, and sustained reduction in lactate dehydrogenase (LDH) levels from baseline to the mean of Weeks 6-12 (p=0.002) and near-complete suppression of complement activity. Fifty percent of eculizumab naïve patients (3/6) who were transfusion-dependent prior to enrollment remained transfusion-free while on study. Meaningful improvements in standard measures of quality of life, as shown by the Functional Assessment of Chronic Illness Therapy (FACIT) fatigue score were observed, as well as a high level of patient satisfaction with subcutaneous self-administration based on patient surveys. Eight of the 10 patients in the naïve cohort continue in the long-term extension study, with the longest treated patients (n=2) dosed through 36 weeks. 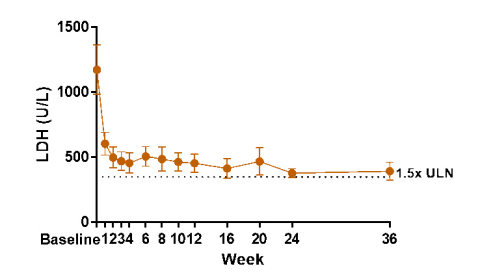 As shown in Figure 1, the clinically meaningful reduction in mean LDH observed during the 12 week Phase 2 dosing period has been sustained in the long-term extension study. In eculizumab switch patients, transfusion-independent patients (n=5) switching to RA101495 SC maintained an overall stable mean LDH level, with one patient withdrawing early due to breakthrough hemolysis and reverting to eculizumab without complications. Among switch patients who were transfusion-dependent at baseline (n=11), breakthrough hemolysis occurred after switching in seven patients (7/11), who all reverted to eculizumab treatment without complications. Persistent transfusion-dependence, which occurs in up to 20 percent of the eculizumab-treated population, is most commonly attributable to extravascular hemolysis driven by intense C3 deposition on erythrocytes. This condition, a unique complication of long-term eculizumab therapy in certain PNH patients, may not be adequately addressed by inhibition at the level of C5, and published data suggest that targeting complement upstream of C5 (e.g. Factor D or C3) may have greater utility in this small subset of PNH patients. In our U.S.-based cohort of patients who were inadequate responders to eculizumab and have a history of elevated LDH levels, all three patients (two transfusion-independent, one transfusion-dependent) have completed 12 weeks of dosing and maintained stable mean LDH levels. As shown in Figure 2, in transfusion-independent patients switching from eculizumab to RA101Stabilization 495 SC, pooled from both the switch cohort and the U.S.-based inadequate responder cohort (collectively, n=7), mean LDH and hemoglobin levels have remained stable in patients enrolled in the long-term extension study through the data cut-off date of February 7, 2018 . No major safety or tolerability concerns have been reported after more than 500 patient weeks of cumulative exposure across all cohorts. No meningococcal infections or thromboembolic events have been observed. Out of more than 3,500 doses administered to date, only nine mild (grade 1) injection site reactions have occurred in a total of five patients. As of February 7, 2018 , full compliance with once daily subcutaneous self-administration of RA101495 SC has been observed. The Phase 2 study provided evidence supporting the dose required for near-complete complement inhibition. Whereas the 0.1 mg/kg dose of RA101495 SC administered in the Phase 2 study in PNH resulted in sub-maximal inhibition of hemolysis (<95% at trough), the 0.3 mg/kg dose of RA101495 SC resulted in near-complete inhibition of hemolysis (≥ 95% at trough at all timepoints). These data support the selection of 0.3 mg/kg RA101495 SC daily as the recommended dose in our Phase 3 studies in PNH. "We are very encouraged by the outcomes in our completed global Phase 2 program in PNH and, following our upcoming end-of-phase 2 discussions with regulators, look forward to initiating a pivotal study in the second half of this year in populations representing the vast majority of PNH patients," said Doug Treco, PhD, President and Chief Executive Officer of Ra Pharma. "The properties of RA101495 SC, including the ability of patients to self-administer RA101495 SC subcutaneously, stability at room temperature, low dose volume, and injection through fine gauge needles, position it as an ideal candidate for the first-line treatment of PNH and other rare complement-mediated diseases. To that end, we also continue to make progress in our recently initiated Phase 2 clinical trial of RA101495 SC in generalized myasthenia gravis, and in a Phase 1b clinical trial designed to enable expansion into atypical hemolytic uremic syndrome and lupus nephritis." Based on the results of the Phase 2 studies, Ra Pharma is planning to conduct a Phase 3 program to support the approval of RA101495 SC in PNH. Both treatment naïve and switch patients who are transfusion-independent on eculizumab are planned for inclusion in Company's Phase 3 program. This press release contains "forward-looking statements" within the meaning of the Private Securities Litigation Reform Act of 1995, including, but not limited to, statements regarding the safety, efficacy and regulatory and clinical progress of our product candidates, including RA101495. All such forward-looking statements are based on management's current expectations of future events and are subject to a number of risks and uncertainties that could cause actual results to differ materially and adversely from those set forth in or implied by such forward-looking statements. These risks and uncertainties include the risks that Ra Pharma's product candidates, including RA101495, will not successfully be developed or commercialized; the risk that topline results as of February 7, 2017 from the Company's global Phase 2 clinical program evaluating RA101495 for the treatment of PNH may not be indicative of final study results; as well as the other factors discussed in the "Risk Factors" section in Ra Pharma's most recently filed Annual Report on Form 10-K, as well as other risks detailed in Ra Pharma's subsequent filings with the Securities and Exchange Commission . There can be no assurance that the actual results or developments anticipated by Ra Pharma will be realized or, even if substantially realized, that they will have the expected consequences to, or effects on, Ra Pharma. All information in this press release is as of the date of the release, and Ra Pharma undertakes no duty to update this information unless required by law.